The Diamond Star quilt block can only be named as such (at least in my opinion) because it has squares set on point, looking like 'diamonds'. There are actually no diamond patches in this quilt block and so, as a result, it is much easier in the construction process. (Diamond patches tend to get over-handled resulting in distorted pieces). So the fact that there are no diamond patches is a good thing! This quilt block is a lesson in itself as it contains two different pieced patches -- flying geese and square in a square. To make these patches you need to cut several half square triangles and quarter square triangles so there is lots of learning here! 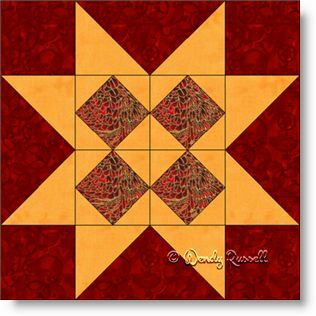 This block is fun to make, and gives a little variation on the usual 'star' quilt blocks. There are both large and small pieces so it is an enjoyable process to make the final product.